Nine people died when demonstrators were shelled by mortar fire in Benghazi’s Kish Square on Friday 24th October. Around a thousand people had gathered in the square for Friday prayers to protest against UNSMIL, Leon and the proposed GNA. In Derna, fighting continues unabated between local citizens affiliated with the Jihadist Derna Mujahideen Shura Council (DMSC) and IS. 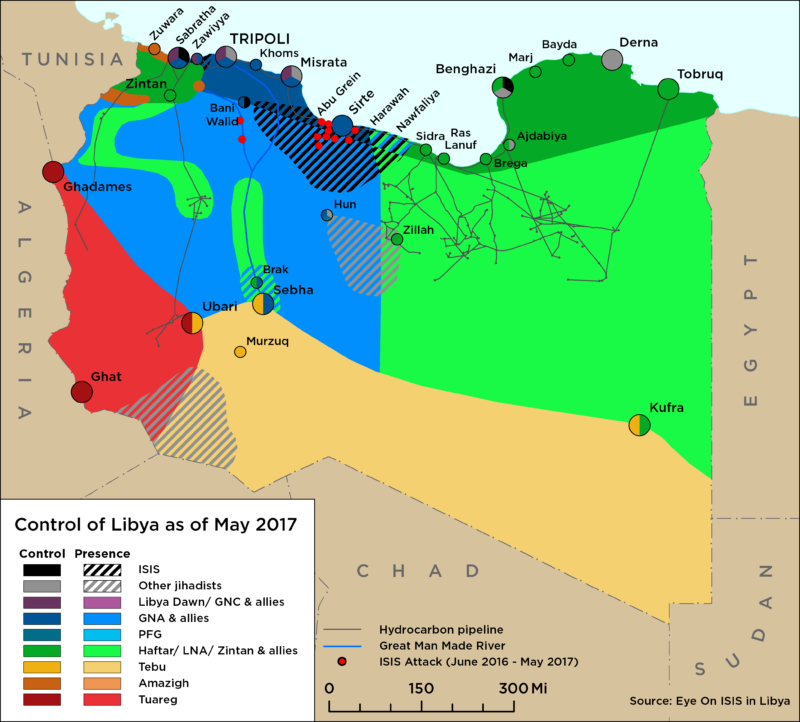 The fragile alliance between the DMSC and LNA continues to hold despite an incident that almost ended in a serious standoff between the two allies. Some fighters of the DMSC challenged members of the LNA unit head by Abu Ghafir, stripping them of their weapons and communications equipment. The incident was resolved by agreeing that Islamic State is the common enemy for now and that differences between the LNA and the DMSC will be settled later. However, such incidents highlight the fragile nature of such alliances. The latest abduction of an LNA by local fighters affiliated with the Ajdabiya Revolutionary Shura Council (ARSC) highlights this point. However, it is noteworthy that IS is reportedly angry that ARSC members handed over the abducted soldier to the civil authorities in Ajdabiya. This is a welcome sign as it indicates a similar situation to Derna, where non-IS Islamists can find common ground with local authorities rather than with IS. 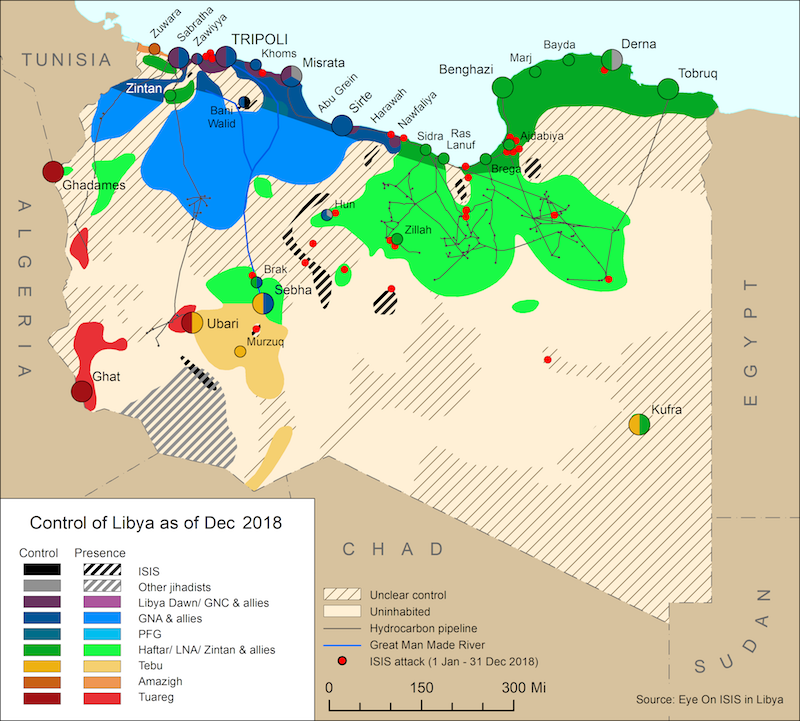 In Sabratha, the latest battle at Al Twila between local militias of Libya Dawn and tribal militias of the HoR, has exposed the fluidity of the term ‘non-state actors’. The battle at Sabratha also exposed the involvement of extremist forces in the ranks of the local militias affiliated with Libya Dawn. After the defeat of the tribal forces and their expulsion from the area, a number of hard-line combatants were recognised and believed to be linked to Ansar Al Sharia in Sabratha.